Raku clay bodies must be designed to endure the thermal shocks of the delicate process of Raku firing without breaking completely apart. Taking pieces out of the kiln when they are very hot can certainly make them more fragile. In order to do this, most regular clay bodies can be converted into raku bodies by the addition of 30 - 50% of an opening agent, such as grog, sand, vermiculite, and so forth. Remember that even though the raku process is low-fire, mid- to high-fire stoneware-based bodies should never be bisqued higher than cone 04. As mentioned above, the clay body must be able to withstand the huge thermal shock of being removed from an incandescent kiln. Many raku clays are cone 6 - 10 stoneware clay bodies that have been modified. Since stoneware already contains a number of refractories such as fire clay, they can often be modified for use in raku with the addition of about 30% grog. Something to note is that the larger and thicker a piece will be, the more resistant to thermal shock the clay must be. In order to accomplish this, simply add more grog or other refractory material. 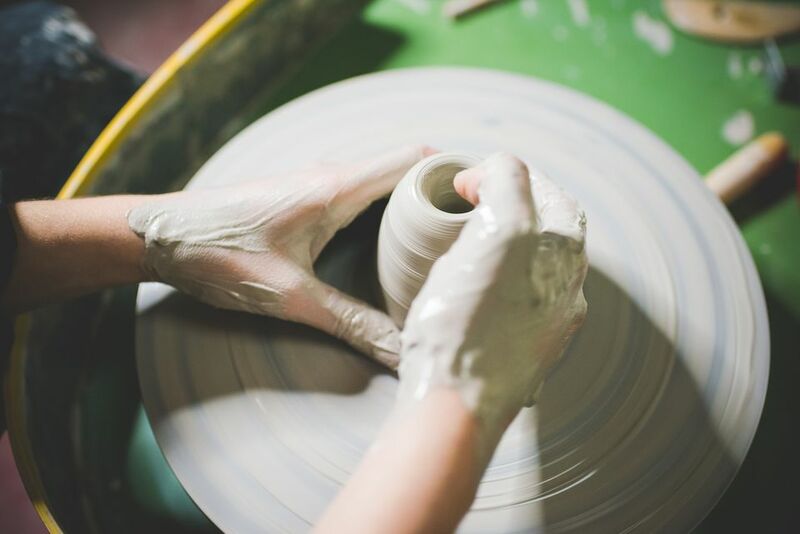 Even though you may associate a high percentage of grog with hand building clays, a raku throwing clay can be designed using fine grog or sand in conjunction with a highly refractory stoneware clay body (such as one with a high percentage of fire clay). Fire clay is a normal clay but it has a higher alumina content, which means it can fire at a higher temperature. Raku throwing clay bodies will typically not be as plastic as other throwing bodies, but can definitely be workable. The clay's texture (or "tooth") is directly related to it plasticity and the ingredients used to reduce problems with thermal shock. Coarse grog or sand will make the texture very rough, whereas a smoother texture can be achieved by using medium or fine grog, sand, or kyanite. Kyanite is often used in heat resistant ceramics and is a crystalline mineral. Other textures (and a more open body) can also be achieved by adding materials that burn out during the bisque firing, such as sawdust, crushed nut shells, nylon fibers, dog hair, horse hair, feathers, paper pulp, cellulose fibers, and so on. As with all clay bodies and glazes, the clay body's color will effect your glaze color. Darker clay bodies will result in darker, more subtle and muted glaze tones. If the clay body carries a high percentage of iron, it can also cause glazes to melt at a slightly lower temperature, especially if the glaze coat is thin. This can do interesting things to the glaze and finished piece. Light gray or buff-colored clay bodies will tend to brighten the glaze colors, allowing more depth within the glaze to be seen, as well as any color variations within the glaze. Many clay bodies can be derived from this extremely simple one, depending on your desires and needs. Hamer, F. & Hamer J. (2004) The potter's dictionary. Philadelphia: University of Pennsylvania Press. If you like a darker clay body, this one introduces a red earthenware as part of its constituents. This clay body holds up well and can be used in larger pieces without undo cracking or warping. If used in a different process, it is a cone 8-10 clay body. Jones, B. (Ed.). (2009) Raku Firing. Westerville, Ohio: The American Ceramic Society. A hand building raku body with 7% shrinkage at cone 08. Not as abrasive as Bakke Raku Body 1, so better suited for throwing. How Does Oxidation And Reduction Influence the Firing of Pottery?